The band, with Aubert, second from left, is looking forward to their Hawaii visit. Over a two-year span, life's been crazy for one Brian Nolan Kalei'ali'i Aubert III. 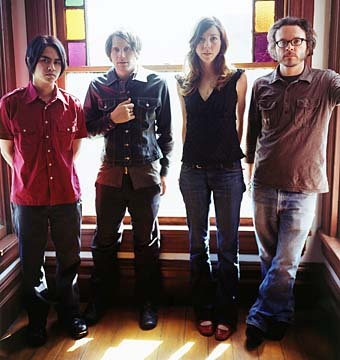 Still, the frontman for the indie rock band Silversun Pickups has kept a relatively level head, despite the whirlwind of activity that has surrounded the foursome since the release of their breakout song "Lazy Eye." The Pickups wed Aubert's lyric voice to attractive melodies shot through with a noise component, in a lo-fi variation on the Smashing Pumpkins sound. "Lazy Eye" has been followed by two other singles from the band's 2006 album "Carnavas," "Well Thought Out Twinkles" and "Little Lover's So Polite," which has been distinguished with a video directed by actor Joaquin Phoenix. Shot late at night in downtown Los Angeles, the music video intercuts scenes of a boy and girl innocently romping through office buildings, with the band performing on a flatbed truck as it drives through the empty streets. As you can tell by his name, Aubert has some ties to the islands, which may be one reason he sounds so effusive over the phone about having the opportunity to finally showcase the band here, as the opening act for Incubus. "Half my family's from Hawaii, and they haven't seen me play," he said from his L.A. home. "My grandparents used to live in Kailua. Hawaii is still very much a part of me." It's his mother who's originally from the Windward side, with the family based on Kauai. Although born in L.A., Aubert says he remembers summers in the islands while growing up. "Some of my actual cousins are these really big Hawaiian guys, and here I am, this little haole boy," he said with a laugh. That total "haole boy" look made for an amusing story that concerned a return visit in 2003 as a surprise for his grandparents. "TheBus was on strike back then, so I had to take a cab from the airport. The driver thought I wasn't familiar with the island, so he's trying to take me to Kailua using H-3! And I said, 'No, no, this is the long way...' "
It was during visits here that Aubert developed his diverse tastes in music. He waxes nostalgic for things like Radio Free Hawaii and Cheapo Music, where he bought albums by an eclectic bunch of artists like Boston, the Carpenters and Joy Division. "I also remember meeting Goth kids in Aiea, and also while I was hanging out on my grandparents' porch in Kailua, I met a Goth girl, and we went to this little coffee shop that was playing the Smiths." With his fellow Pickups, bassist Nikki Monninger, drummer Christopher Guanlao and keyboardist Joe Lester, Aubert is spending down time off the road by starting to write a follow-up to "Carnavas." "We got our practice space, so we'll take a couple of months to record over the summer, and hopefully get the new release out by fall." Despite the international acclaim the band's been getting -- the Silversun Pickups just won the Favourite International Group of the Year award at the fan-voted Canadian Indies -- the band plans to continue to keep it real and manageable. "We'd already been playing for quite a while before all this happened. The music grew organically, and it wasn't meant to be anything that has become this big. We like the freedom of being an independent band and recording for an independent label (Dangerbird). We're not going to write just to get radio airplay. We'll always be honest to ourselves." And Aubert said the band members remain on solid terms with each other. "We've been friends for a long time, so whatever differences we may have had with each other, we got it all out before all this happened. We know each other really well, so when things get funky sometimes, we give each other space. "It's all about the music we play. ... It's just amazing how lucky we've been. It blows our minds. And we're willing to work hard. We're not afraid of not being home." That confidence comes with Aubert's growing sense as a singer-songwriter. "I admit it took a while to get over my shyness, but now the songs are part of the whole philosophy of the band, which is, this is how we sound, and if you don't like it, there's nothing we can do about it. This is what it is."